We’ve created a ‘glossary of terms’ to help you with buying your firewood online. Logs that have been recently cut and put inside a kiln, which will quickly reduce the moisture within them. Traditionally logs have been dried out over a period of time – months or even seasons. The negative side to natural drying out is that it takes time and is less likely to get the moisture level to the lowest possible levels. Certain wood such as the oak species can take several seasons to dry out. Kiln dried logs are the best logs to buy because they’re ready for burning, which is why they’re often also referred to as ‘ready to burn logs’. The generic term for wood that you burn on a fire. The term can be applied to any wood that’s chopped up for use on the fire, whether it’s wood from an old bed frame or logs specifically split and prepared for burning. Each species of wood falls within the soft or hard category. Wood species, such as oak or ash are considered hardwood due to their density. Hardwood has traditionally been utilised for its strength in construction. Burning hardwood also provides an economic advantage as its density means it takes longer to burn, meaning logs last longer. Firewood cut into narrow lengths. The purpose of kindling is to help form an initial ‘easy to light and burn’ core of a fire. Once the fire has established the kindling will help your logs or coal to catch fire. The generic term for firewood cut from the trunk or branch of a tree. A stove that can burn both wood and coal. Non-chemical coated firelighters made from wood shavings, coated in a flammable wax. Logs that have been left to dry out for at least one season. This is the traditional and natural method used to dry out logs. Seasoned logs are often stored under a cover with ventilation to aid the natural drying process. Logs that have been dried out during hotter seasons are best as there is more chance of moisture being reduced. Softwood takes less time than hardwood to dry out. Some hardwood such as oak, can actually take several seasons to reach the low moisture content levels required for a wood burning stove. Different species fall into different wood type categories. Pine and cedar are typically softer types of wood. This can be an advantage in construction as it’s easier to shape and work with. In terms of burning however, it tends to burn much quicker. The term for logs that have recently been cut from a tree. Trees contain moisture in order to grow, therefore logs need to dry out to be ready for burning. Different wood species take different lengths of time to dry out. The term seasoned is used as logs are stored for the duration of a ‘season’ to dry out. The term for different types of wood. It is unknown exactly how many different wood species there are as there is no universal identification method, although it has been estimated that there are over 25,000 different species. 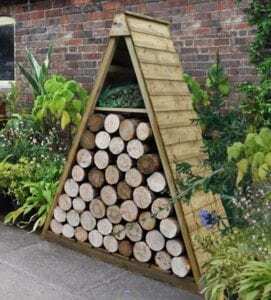 A wood store is the storage area where logs are stacked, before being burnt or put in to naturally dry out. Wood stores are often timber framed, feature a pitched roof and vented sides. When storing logs before use, it’s essential to keep them under a cover to prevent rainfall from penetrating the wood as wet wood doesn’t burn well. We hope you found the above information useful. If you have any questions about buying firewood online, get in touch.